In the future, maybe we’ll all be pressing buttons on countertop machines that will squeeze various food pastes into the creative shapes of our choice. 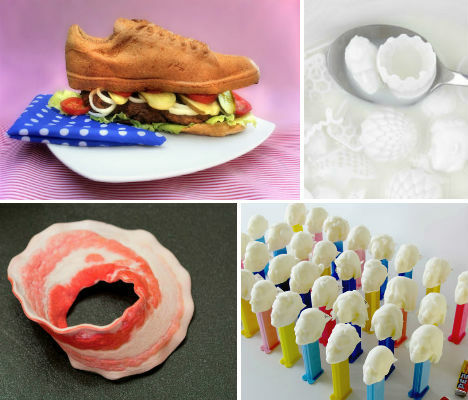 The 3D printing revolution isn’t limited to fashion, pretty objects, guns or even architecture – it’s edible, too. A combination of scans, special digital files and machines that extrude materials into complex forms might just make food more of an art form than ever before, if these 14 examples are a preview of what’s to come. 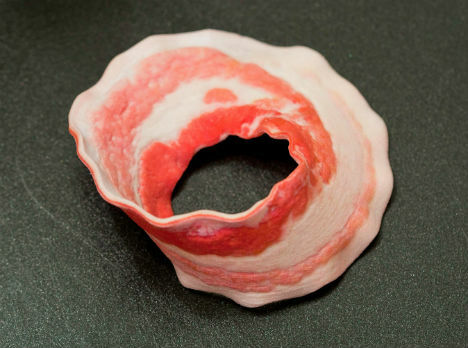 In a possibly Freudian typo, Shapeways describes this Bacon Mobius Strip as “not delicious but also vegan and kosher-friendly.” You can order one of your very own to keep forever as a bizarre conversation piece on the mantel, or recurring breakfast gag. 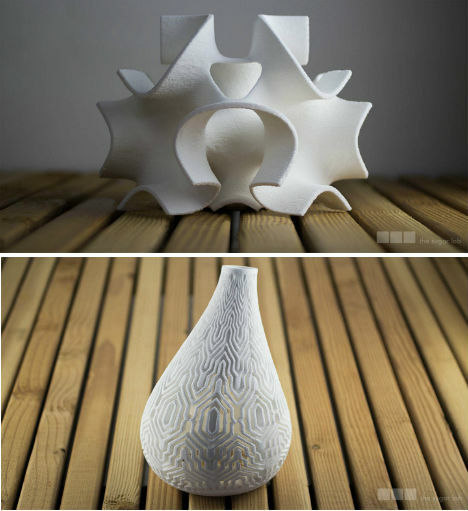 How will 3D printing technology be applied to the home of the future? Designer Janne Kytannen of Freedom of Creation envisions our own little countertop printing machines capable of producing pasta, cereal, burgers and more. Kytannen believes that as the ability to design our own food becomes more accessible, the items we choose to eat will become far more creative and complex. 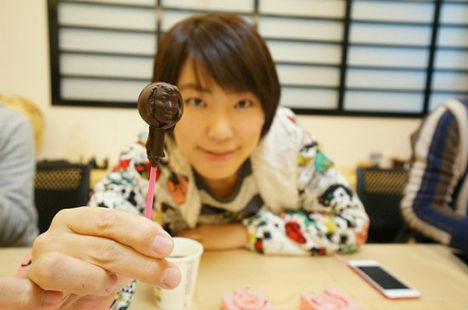 A 3D printing workshop in Tokyo produced miniature chocolate versions of the creators’ faces. Each person went into a small room to get a full body scan, and a 3D printed mold was made of their heads. Now, they can make chocolates and other confections in the shape of their own faces again and again. Tokyo’s FabCafe sells the molds for $65 each. 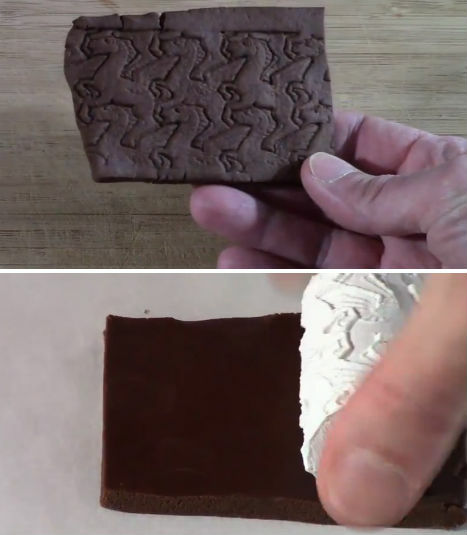 A slab of ordinary cookie dough was made into Escher-inspired cookies using a 3D-printed roller. George W. Hart converts patterns into 3D-printed rollers using a MakerBot; you can download the software and files to make your own at his website. 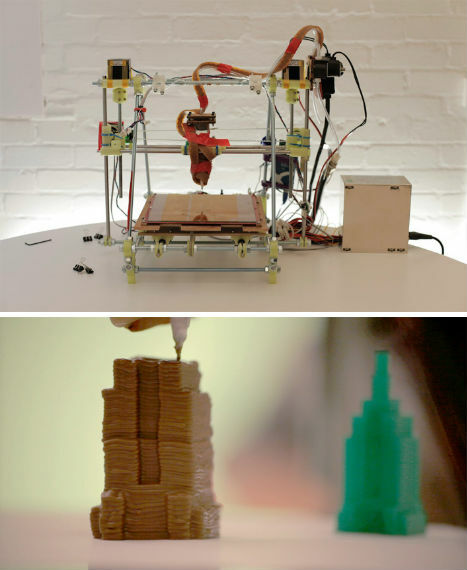 Deemed the world’s highest-resolution 3D-printed chocolates, these sugary confections from Moving Brands started out as a fun project and turned into a learning process about the intricacies of 3D printing with various materials. “We had to think about the physical properties of molten plastic and the structural integrity of layers… We had to become conversant with how the machine was put together and even how it sounded and smelled,” explained the project technical lead, Daniel Soltis. 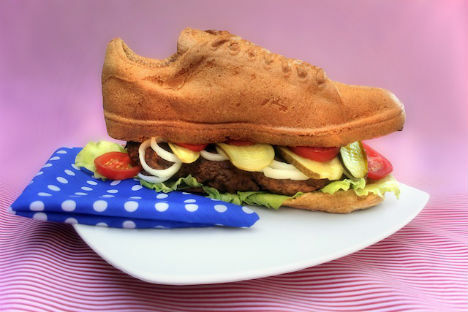 A shoe isn’t typically the most delicious-looking object, but Tristan Bethe managed to make one look pretty good in both burger bun and chocolate form. Tristan 3D-scanned his own shoe, made a food-safe silicone mold and poured in the mix for both items. 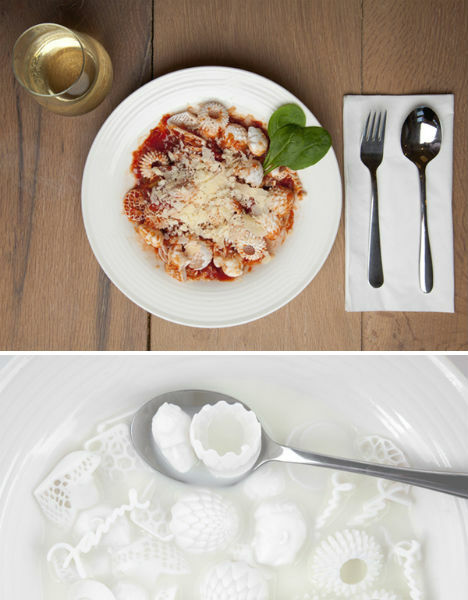 Cornell University’s [email protected] program has provided designers with 3D printers equipped with syringes that squeeze out pastes of various kinds, including pasta dough. 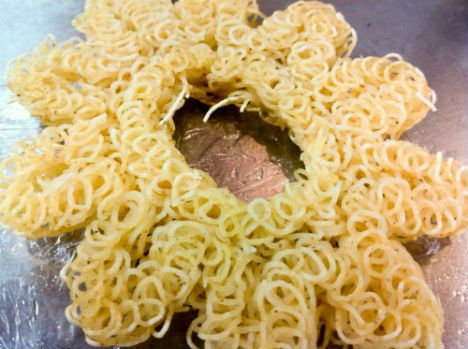 Dave Arnold of Cooking Issues used his to make noodles in cool shapes. “I find that whole idea, which removes ourselves even further from the way our food is made, horrifying. Dinner from a series of homogeneous pastes?” says Arnold; but ultimately, the noodles he created were so delicious he could barely capture them on camera before they disappeared.